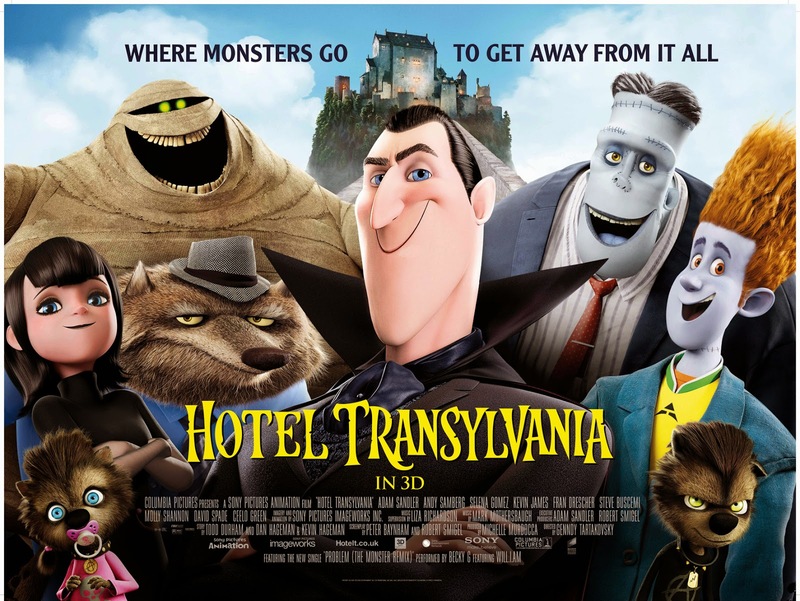 Hotel Transylvania is a 2012 American 3D computer animated fantasy comedy film produced by Sony Pictures Animation. It was directed by Genndy Tartakovsky, the creator of Samurai Jack, Dexter's Laboratory and Sym-Bionic Titan, and produced by Michelle Murdocca. The film features the voices of Adam Sandler, Andy Samberg, Selena Gomez, Kevin James, Fran Drescher, Steve Buscemi, Molly Shannon, David Spade and CeeLo Green. The film tells a story of Count Dracula, the owner of a hotel called Hotel Transylvania where the world's monsters can take a rest from human civilization. Dracula invites some of the most famous monsters to celebrate the 118th birthday of his daughter Mavis. When the "no-human hotel" is unexpectedly visited by an ordinary 21-year-old traveler named Jonathan, Dracula must protect Mavis from falling in love with him before the hotel's guests learn there is a human in the castle, which may jeopardize the hotel's future. The film was released on September 28, 2012 by Columbia Pictures. It was met with mixed critical reception from critics, while the general public received it favorably. Despite mixed reviews, Hotel Transylvania set a new record for the highest-grossing September opening weekend ever, earning a total of $358 million on a budget of $85 million. The film was nominated for a Golden Globe Award for Best Animated Feature Film. A sequel titled Hotel Transylvania 2 is scheduled to be released in theaters on September 25, 2015. In the aftermath of the death of his wife Martha (Jackie Sandler), Count Dracula (Adam Sandler) designs and builds a massive five-star hotel in which to raise his daughter Mavis (Selena Gomez) and to serve as a getaway for all the world's monsters. Famous ones such as Frank (Kevin James) and his wife Eunice (Fran Drescher), Wayne and Wanda Werewolf (Steve Buscemi and Molly Shannon) and their massive immediate family, Griffin, the Invisible Man (David Spade), and Murray the Mummy (CeeLo Green) often come to stay at the hotel which is completely human free and safe for monsters. On her 118th birthday, Dracula allows his daughter to leave the castle in order to explore the human world, but he sets up an elaborate plan using his zombie bellhops disguised as humans to make them seem intimidating and frighten her home. The plan works, but the zombies inadvertently lure a 21-year-old human named Jonathan (Andy Samberg) to the hotel. Dracula frantically disguises him as a Flesh Golem and passes him off as "Johnnystein", a distant cousin of Frank's right arm. Jonathan soon encounters Mavis and the two "Zing" (a form of magical attraction). Unable to get Johnny out of the hotel without notice, Drac quickly improvises that Jonathan is a party planner, brought in to bring a fresher approach to his own traditional and boring parties. Jonathan quickly becomes a hit to the other monsters, especially Mavis and even begins to gain Dracula's respect. Dracula then tells Jonathan that he dislikes humans because of the death of his wife at the hands of an angry mob shortly after Mavis was born. Much to Dracula's surprise, Jonathan shows understanding and knowledge of the vampire lore. Johnny attempts to leave after his confession on Dracula's orders, but is brought back by Mavis. After showing her the beauty of a sunrise, she is re-inspired to give humans another chance. Meanwhile, Quasimodo (Jon Lovitz) learns that Johnny is a human with his female pet rat Esmeralda's help and kidnaps him in order to cook him. Dracula intervenes and magically freezes Quasimodo to keep him from telling anyone that Jonathan is human. The party is a great success the next night. But when Mavis kisses Jonathan, Dracula overreacts and in his outburst confesses to deceiving Mavis with the town. A still-frozen Quasimodo bursts in and the Fly (Chris Parnell) translates his frozen language that reveals Johnny's humanity causing overwhelmingly negative reactions from the guests. Mavis is undeterred by her attraction and wants to be with Johnny even though he is human, but Jonathan rejects her out of respect for her father and leaves the hotel. Mavis then angrily yells at Dracula and flies off. Dracula arrives to comfort Mavis on the roof looking at the present her mother gave her for her birthday and finds out that it is a book about how her mother and Dracula had a Zing. Dracula then realizes that Mavis and Jonathan had a Zing, but he got in the way. After apologizing to the monsters that are trying to check out and confessing that even he does not know if humans have changed, Dracula manages to convince Frank, Wayne, Griffin, and Murray to help him find Jonathan, reunite them and they learn that he is bound on a flight out of Transylvania soon. They head to the airport and encounter a Monster Festival along the way. Instead of being frightened by the real monsters appearing, the humans help Dracula by providing him shelter from the sunlight so he can get to the airport quickly, only to see Jonathan's plane taking off. Deciding to take the risk, Dracula gives chase, burning in the sunlight. After getting Jonathan's attention, Dracula makes his way to the front of the plane and uses his mind-controlling power on the pilot (Brian Stack) to help him apologize for his actions. Jonathan accepts his apology; then Dracula manipulates the pilot to return to the Transylvanian airport for a "refuel". Dracula returns Jonathan to Mavis, who confesses that their Zing was mutual and the two kiss, making Dracula realize his little girl is all grown up and can make her own decisions. The monsters finish celebrating Mavis's party as Dracula, Mavis, Jonathan, Frank, Eunice, Murray, Wayne, Wanda and Griffin sing "The Zing" in front of the other monsters.